In this category are listed all the sites that do not belong to other categories. If you are a Webmaster, and you are looking in which category to submit, and you don't find adequate one, you can submit here. One of the most popular mode to express yourself in the net are blogs, together with already unbeatable social networks. Big Bung makes a little piece of our virtual reality (here is a contradiction between last two words). 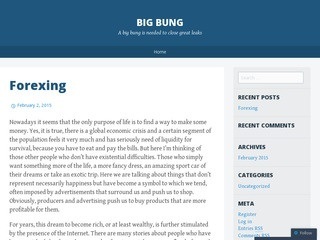 The blog is born in February, 2015 with efforts of 3 friends that decided to entrust the part of their lives to the computer realm. They talk about their lifeâ€™s experiences, about the society that surrounds us and explicit own thought. Each one have an own history, memories and political position, but the common point of view is spirituality. The fact that they consider much more important than material area. To give a prove of this, the first article face up to our need to possess the things so strongly that this desire become an aim of our life. And to reach it, itâ€™s necessary to earn a lot of money. The richness takes us far away from holiness. A rich man has more problem to die because must leave his properties on the Earth, while the death often is a salvation for poor people. A variety of self-actualization resources on how to be happy. Sign up for the free Happy Class or subscribe to A Daily Dose of Happiness. Whether you are trying to save money or make money with a work at home job or a home based business, FrugalMom has the information and resources you need. Cursos de InglÃ©s, FrancÃ©s, EspaÃ±ol, AlemÃ¡n e Italiano en la Universidad de Alicante. Dirigido a todos los colectivos: particulares, empresas, alumnos de la universidad y personal.